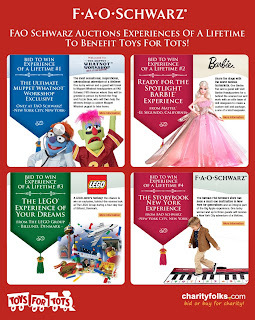 FAO Schwarz presents four magical experiences you can bid on while benefitting Toys for Tots. FAO Schwarz Presents: Experience the Magic of The Storybook New York Experience from FAO Schwarz – New York City, New York! Bidding closes on 12/10 and is already at $4,500. The Ultimate Muppet Whatnot Workshop Experience from FAO Schwarz – New York City, New York! Bidding closes on 12/10 and next bid requirement is $6,500. Ready for the Spotlight Barbie Experience from Mattel – El Segundo, California! Bidding ends 12/10 and is at $4,750. The LEGO Experience of Your Dreams from The LEGO Group – Billund, Denmark on May 19-21, 2010! Bidding ends 12/10 and current bid is at $17,000! I wished I had that kind of money!